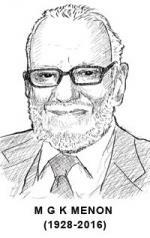 High energy particle physicist M G K Menon died at the age of 88. Goku to his friends, he was not only a great scientist, but a great science leader. Menon is known for his pioneering scientific contributions to nuclear emulsion techniques, elucidation of the properties of strange particles, and cosmic ray studies near the geomagnetic equator. Awarded a PhD at a relatively young age of 25, Menon returned to India in 1955 and joined the Tata Institute of Fundamental Research (TIFR) at the invitation of its founder, Homi Bhabha. A decade later, Menon became the director of TIFR, when Bhabha died in an air crash. Menon also established one of the world's leading groups on the study of cosmic rays near the geomagnetic equator from high-altitude balloon flights. It is amazing to see the various responsibilities, diverse and complex, that Menon was entrusted with by the nation, several of them together. For example, he was the chairperson of the Electronics Commission and the secretary of the Department of Electronics during the seventies, when the Indian electronics sector was in a nascent stage. He was also the chairperson of the Indian Space Research Organisation in the early seventies. Menon was a scientific adviser to the Defence Minister, a secretary to the Department of Defence Research, and the director-general of the Defence Research and Development Organisation in the mid-seventies. He became the secretary of the Department of Science & Technology in the early eighties, when he masterminded the Technology Policy, 1983, which provided the foundational structure of Indian science and technology. He was the secretary of the Department of Environment in the early eighties, when environment was beginning to appear on the agenda of nations for the first time. Menon was also the director-general of the Council of Scientific & Industrial Research for three years. I wish to narrate my personal experience with Menon to illustrate a special quality of Menon. I had met him for the first time in 1978, when I was a polymer scientist in the National Chemical Laboratory (NCL). Almost a decade later, I met him as the NCLl's director. During our meeting in 1987, I had shared an idea of establishing a polymer science and engineering division at the NCL, which I did after becoming the director of the institute. Almost a decade later, when I took him around, I was astonished to see that he remembered some of the key points from our earlier discussion. I was amazed not only by his memory, but also his in-depth knowledge and deep understanding of a vast array of subjects. From the beginning of his career, he was entrusted with several responsibilities in different domains that were to play a critical role in our nation's growth. He worked in the areas of electronics, environment, new energy and in strategic areas such as space and defense. And all this was in the formative years of India, when it was taking the first determined steps to build its science enterprise. It is fair to say that Menon was the leading architect, who helped build a world-class Indian physical and intellectual infrastructure in science and technology. Menon's sterling human qualities, his exceptional ability to take a holistic view, his high intellect and his astute administrative abilities helped him become one of the true statesmen of Indian science. His contributions helped India create a strong foundation of its science and technology enterprise, which is shaping today the country's aspirations to become a major global power in science, technology and innovation.